Paint an image according to the pattern you see, with the signature: Jesus, I trust in You. I desire that this image be venerated, first in your chapel, and [then} throughout the world. I promise that the soul that will venerate this image will not perish. I also promise victory over [its] enemies already here on earth, especially at the hour of death. I Myself will defend it as My own glory” (Diary, 47-48). My image already is in your soul. I desire that there be a Feast of Mercy. I want this image, which you will paint with a brush, to be solemnly blessed on the first Sunday after Easter; that Sunday is to be the Feast of Mercy” (Diary, 49). “The two rays denote Blood and Water. The pale ray stands for the Water which makes souls righteous. The red ray stands for the Blood which is the life of souls. These two rays issued forth from the depths of My tender mercy when My agonized Heart was opened by a lance on the Cross... Happy is the one who will dwell in their shelter, for the just hand of God shall not lay hold of him” (Diary, 299). The Lord reveals to us His Pierced Heart, the water and blood that flow from His heart are a fountain of mercy and reconciliation for all men. 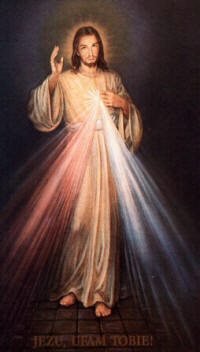 This revelation is a continuation of the Divine Mercy that Our Lord offers us in the Cross and which he revealed also to St. Margaret Mary. “By means of this Image I shall be granting many graces to souls; so let every souls; so let every soul have access to it” (Diary #570).